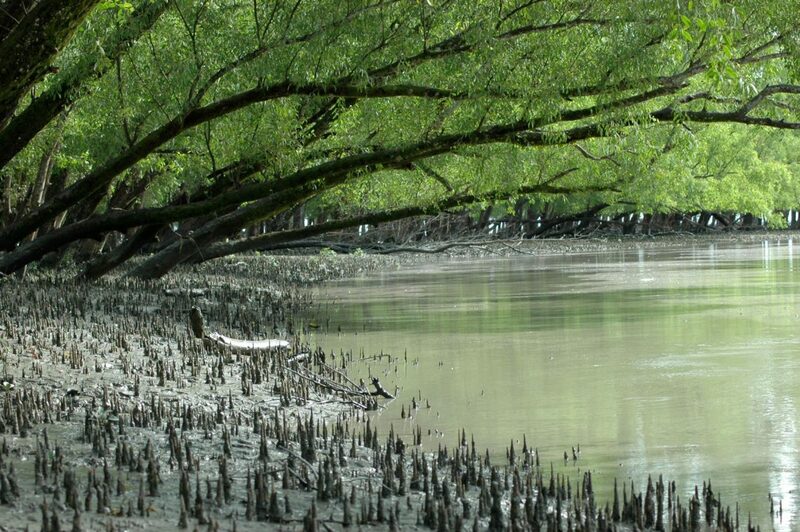 Can Mangroves Mitigate Catastrophic Consequences Of Cyclone-Induced Storm Surges? Massive flooding from storm surges is a major threat to lives and property in low-lying coastal areas during cyclones. The impacts are particularly disastrous when storm surges strike densely populated coastal areas without storm-resilient infrastructure, as the recent storm Idai (March 2019) brutally demonstrated. This category 3 cyclone caused widespread damages and loss of life in Mozambique, Zimbabwe, Malawi, and Madagascar, killing 432 people and severely affecting more than 2.5 million of the population. Some of the other recent examples of cyclone-induced storm surges that caused catastrophic consequences include Hurricane Harvey 2017 (2.1m/7 ft), Haiyan 2013 (5.2m or 17 ft), Aila 2009 (4m/13ft), Sidr 2007 (4m /13ft), and Katrina 2005 (7.6m-8.5m/25-28 ft). When cyclones strike, mangrove forests help protect adjacent coastal areas from storm surges by obstructing the flow of water with their roots, trunks, and leaves. The extent of protection from mangroves depends on the width of the forest, forest density, the diameter of stems, and roots of trees along with forest floor shape, bathymetry, spectral characteristics of waves, and the tidal stage at which waves enter the forest. Coastal managers increasingly recognize the potential utility of mangroves in disaster risk reduction, however, efficient use of this ecosystem-based protection is often hindered by the scarcity of location-specific information on the protective capacity of mangroves. 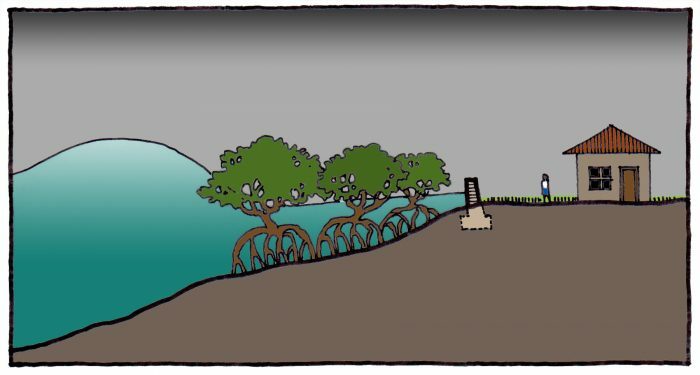 Unfortunately, many cyclone-prone countries currently lack adequate mangroves, as significant clearing of mangroves took place for aquaculture, tourism, industrial/urban development, and overexploitation of timber over time. Making better use of mangroves for coastal protection would, therefore, require new plantation as well as restoration of mangroves in many surge-prone areas. As the extent of protection depends on the mangrove species (diameter of stems and roots), the width of forest and forest density, a site-specific analysis is required to maximize the efficient use of mangroves for coastal protection. To get a deeper insight into the design issues, I conducted research in collaboration with the Institute of Water Modeling in Bangladesh – one of the world’s most vulnerable countries to tropical cyclones. The study focused on seven coastal locations. We used a hydrodynamic model for the Bay of Bengal based on the MIKE21FM system to replicate the category 4 Cyclone Sidr, which generated a 12-15 ft storm surge along the Khulna-Barisal coast of southwest Bangladesh in 2007. Recently published in PLOS One, our study estimated surge height and water flow velocity, first without mangroves and then with various forest widths and planting densities of different mangrove species. Our findings show varying levels of protection from mangroves for different tree species and forest widths and densities across the seven locations. Sonneratia apetala was the species that provided the greatest protection. Mangroves generally reduced surge height by 4cm to 16.5cm with mangrove belts of 50m to 2km width, and reduced water flow velocity by 29 to 92 percent with forest widths of 50m or 100m. The findings also highlighted that the range of protection is location-specific. Quantifying the protective capacity of mangroves from storm surges in coastal Bangladesh, our study emphasizes the important role mangroves can play in a multi-dimensional approach for protection against cyclonic surges. For protection from cyclones, mangroves may be particularly effective in protecting rural areas where populations are widely dispersed and the construction of built infrastructures like seawalls may not be economically feasible over long coastlines. In contrast, for densely populated coastal regions, mangroves alone will not fully protect population, assets, and activities at risk considering the reduction of surge height from mangroves is generally modest. However, even a modest reduction in surge height provided by healthy mangroves in the foreshore of embankments will allow embankment heights to be lower, thereby reducing the cost of construction considerably. Illustration courtesy Pritthijit (Raja) Kundu. In addition, the significant reduction in water flow velocity from planting mangroves will protect the built infrastructure from breaching, toe-erosion, and other types of damage, and will reduce infrastructure maintenance costs. As mangroves could be 2 to 6 times less expensive than other commonly used alternatives (Narayan et al, 2016), the use of mangroves in combination with built infrastructure for surge protection will always be cost-effective; the process of designing embankments should consider the benefits and costs of mangrove planting early on. 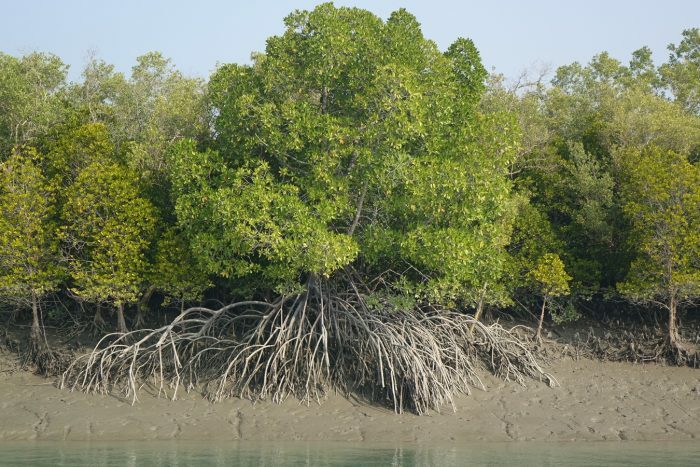 These findings are described in the article entitled Quantifying the protective capacity of mangroves from storm surges in coastal Bangladesh, recently published in the journal PLOS One. 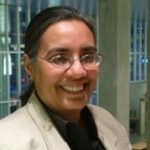 Susmita Dasgupta is a Lead Environmental Economist in the Environment and Energy Team of the Development Research Group with a specialization in empirical research. Her research focus is on environmental management in developing countries. Dr. Dasgupta has done extensive analysis on health hazards of pollution, poverty/environment nexus, setting priorities in pollution control, deforestation, biodiversity loss, impacts of climate change on coastal zones and climate extremes, adaptation to climate change, cost-effective regulations, monitoring and enforcement of regulations. She has conducted research activities in Bangladesh, Brazil, Cambodia, China, Colombia, Cuba, India, Iran, Lao PDR, Madagascar, Mexico, Tunisia, Vietnam and Yemen, and has published numerous articles on issues related to development and environment. Before joining the Bank in 1992, she taught at the American University and the State University of New York at Albany. She holds a B. Sc from Presidency College, India; an M. Sc. from the University of Calcutta, India; an M. Sc. and a Ph. D. in economics from the State University of New York at Albany.